The vineyard covers 200 000 ha in valleys running from the Andes to the Pacific Ocean. 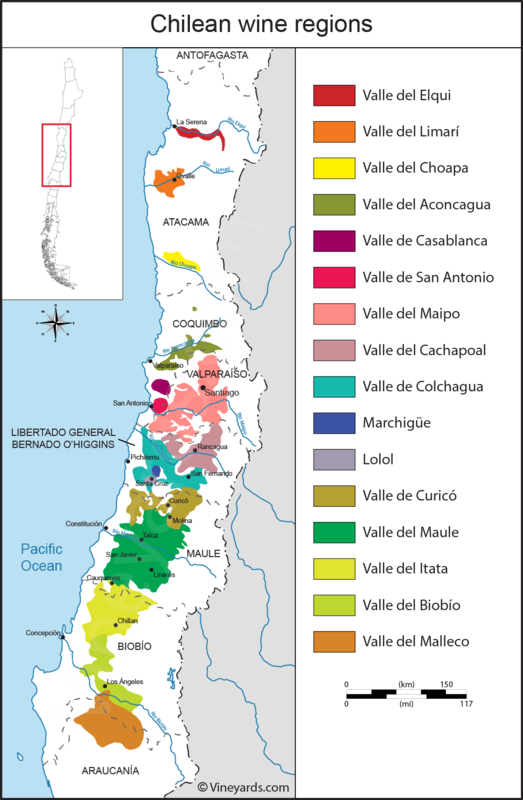 Chile was the sixth largest wine producing country in 2015 with a production of about 1,280 million liters (source OIV) and the fifth largest wine exporter. European grape vines, Vitis Vinifera, arrived with the spanish conquistadors and missionaries around 1555, the variety planted then was País. Is was brought to Mexico by Hernán Cortés in 1520. In the 19th century, french immigrants and investors changed the chilean vineyard with their knowledge, new techniques and new varieties like Cabernet sauvignon, Carmenère, Malbec, Merlot and Sauvignon blanc. An interesting and surprising point, Chile has remained free of Phylloxera.